Professor Elias Stathatos was born in 1968 in Patras, Greece. He obtained his first degree in Physics from University of Patras and then his PhD degree from Engineering Science Department also at University of Patras. Prof. Stathatos was a postdoctoral research fellow in University of Cincinnati, USA at the Civil & Environmental Engineering Dept. In period 2008-2010 he was Department Head of the Electrical-Engineering Department in Technological-Educational Institute of Patras. 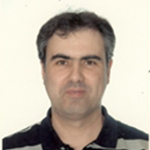 Professor Stathatos is the head of the Nanotechnology and Advanced Materials Laboratory and he has more than 100 publications in peer review journals and five chapters in books which are recognized of more than 4000 citations (h-factor=33). He is Principal/co-Principal Investigator in 25 funded proposals while he is a co-investigator in five patents related to solar energy conversion and solar cells. He has participated in more than 60 conferences giving several plenary and invited lectures. He is a reviewer in numerous International Journals (>40) and an editorial board member for “Journal of Advanced Oxidation Technologies”, “Materials Science for Semiconductor Processing”, “International Journal of Photoenergy” and “Heliyon”. His research interests are focused in third generation solar cells and their characterization. In particular, prof. Stathatos is interested in the conversion of solar into electrical energy using dye-sensitized solar cells employing nanosctuctured materials and also to the heterogeneous photocatalysis based on nanocomposite semiconducting oxides. Furthermore, prof. Stathatos is also interested to the organic electronic devices such as OLED and OFET. Dye sensitized solar cells (DSSCs) have attracted substantial interest as a low-cost alternative to conventional silicon-based solar cells owing to the simplicity of their fabrication procedures, practically under ambient conditions with mild chemical processes. The overall efficiency ~12% (for laboratory small sized cells) placed DSSCs as potential inexpensive alternatives to solid state devices. DSSCs are placed in the category of third generation photovoltaics where new trends and materials in the photovoltaic technology are applied. Third generation solar cells, are based on nanostructured (mesoscopic) semiconductors and they are made of purely organic or a mixture of organic and inorganic components, thus allowing a vast and inexhaustible choice of materials. Because of their mesoscopic character, it is possible to make transparent solar cells, which can be used as photovoltaic windows. Photovoltaic windows can be functioned by front-face light incidence but also by diffuse light and even by back face light incidence. A large volume of the recent works on DSSC’s is devoted to the study of structural properties of the inorganic semiconductor as negative electrode and the physicochemical state of the electrolyte. Especially for the electrolyte the extensive concern is dictated by the poor long term photochemical stability of the devices due to leakage of the electrolyte caused by sealing problems as well as poor stability and durability of liquid electrolytes. At the present lecture, we shall demonstrate evidences from basic research concerning materials’ structural properties and electrical studies for transparent dye sensitized solar cells fabricated with thin TiO2 films prepared with inkjet printing technique. We shall also discuss our experiences from laboratory scale fabrication methods to manufacturing and we will demonstrate the case of highly durable solar cell and modules made with nanocomposite materials and quasi-solid electrolytes avoiding problems of leakage and solvent’s evaporation. In particular, we will present the case of highly transparent strip type quasi-solid state dye-sensitized solar modules which were fabricated through inkjet printing method using nanocomposite TiO2 inks as raw materials and tested under outdoor illumination conditions.